It is a requirement of your Agreement, that the goods are protected against Theft and Accidental Damage. We can arrange Theft & Accidental Damage Cover for £0.57 per week. It is a requirement that products purchased on a credit agreement are insured. We can offer Theft and Accidental Damage Cover for £0.57 per week. 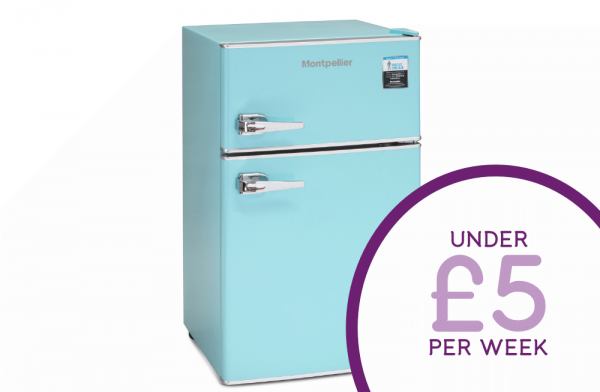 Part of their retro range, Montpellier have created a fun fridge freezer which oozes 1950's style. In Blue, this fridge freezer is a compact appliance which will easy sit underneath your counter. Inside the fridge is classic thick glass shelves which can store all your heavy food item along with a bottom compartment. To top is off in true modern technology, control the temperature of your fridge at all times with 5 different settings.